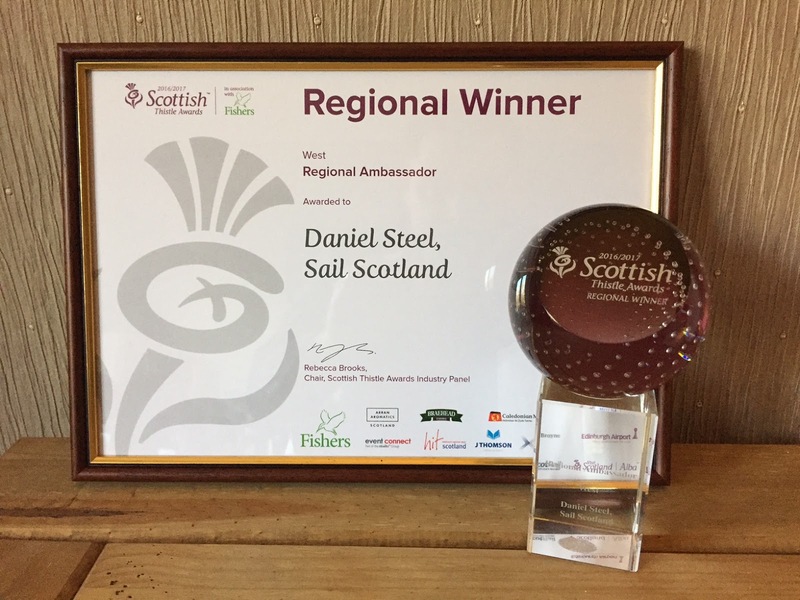 Congratulations to Sail Scotland's CEO Daniel Steel on winning the West Region Ambassador award at this years Thistle Awards Regional Finals. The Scottish Thistle Awards have been recognised as the tourism industries equivalent to the Oscars for more than 20 years. The awards acknowledge those hard working businesses and individuals who dedicate their working lives to this vibrant Scottish industry employing more than 200,000 people across the country. Sail Scotland CEO, Daniel Steel has become the face of Scotlands Marine Tourism industry around the world since assuming the role 2013. This year in recognition of his efforts Daniel won the West Region Ambassador award amidst stiff competition from other nominees, James Danway of Biggar & Upper Clydeside Museum and Karen Donnelly of Love Loch Lomond. "I am honoured and hubled to receive the Ambassador Award. I spend a lot of time talking directly to potential visitors across the world and their passion for exploring our coasts and waterways reminds me regularly why Scotland is so very special.... they are our real ambassadors. This is thanks to the dedication of our industry Board who volunteer their time and to our members who are constantly innovating and making Scotland a world class destination for sailing and boating"
Daniel now progresses to the national finals held in Edinburgh in March 2017 and we wish him the best of luck. However before then he will be taking Sail Scotland on the road attending shows around Europe, visiting countries including Sweden and Holland; promoting what Scotland has to offer.